It won’t be that difficult to look breathtaking on your big day if you already have Rapunzel-like tresses. Go beyond the plain braid or bun routine and flaunt the length of your hair with these hairdos. 1. Four strand braid: Instead of three, use four strands to plait your hair. A few loose strands swinging over the face and a twisted end will be perfect add-ons. Add some stone-encrusted pins in the bends if you like. This style looks great with an Anarkali or a lehnga. 2. Side swept cascade: Tong your hair and let it fall on one side; allow the hair to resemble a waterfall. Back comb at crown to create volume. Style with spray for it to shine and set. This style is ideal for informal functions such as the Sangeet. 3. Beehive floral chignon: Back comb hair on the crown. Roll hair into a chignon and decorate with flowers for an elegant reception look. 4. Braided chignon: A neat vintage bun will always be evergreen for the engagement. Add some shine serum to hair and part in the middle. Make tight braid on either side and twist them together into one bun at the nape. Secure with pins. 5. 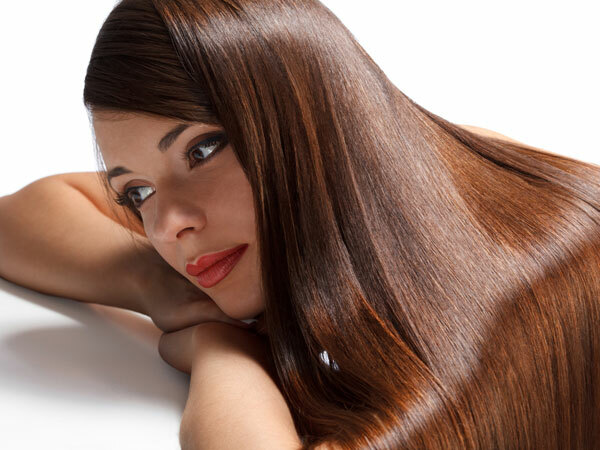 Soft waves: Simply tong your hair lightly and open with fingers dampened with a leave-in serum. Part in the middle and do remember to wear a maangtika to enhance this style. This style is ideal for a mehndi or sangeet and cocktail night. 6. Bouffant with side ponytail: This style is ideal for an engagement party or a casual lunch with family and looks great with Indo-western outfits. 7. Ponytail bun: If you are too tired with all the festivities and want something that you can do without much ado, opt for this hairstyle where you are just giving a pony a fresh makeover. 8. Twist and turn top knot: A 2-minute hairstyle when all you do divide your hair into three segments. Turn the middle one into a top knot and twist either side sections over it and secure with pins. 9. Infinity knot: Let your hair lose but keep them from coming onto your face by tying two side sections into an infinity knot. 10. 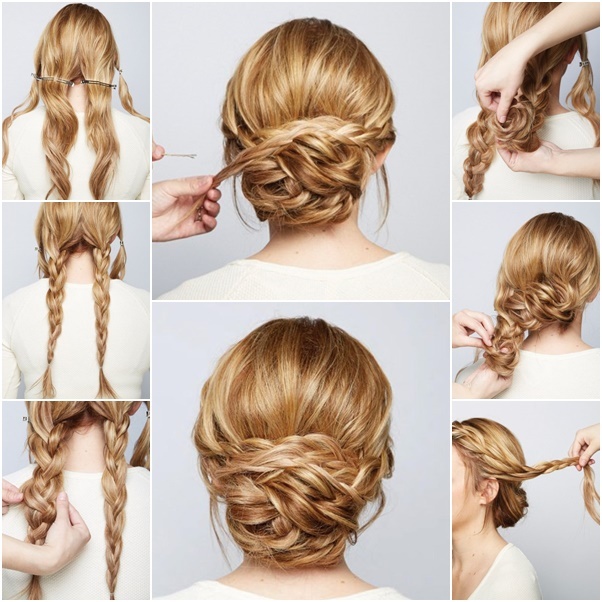 Ladder braid or bun: This is a little complicated hairstyle that would need a little bit of practice to perfect. Even if it is a tad messy, don’t worry, because that is the idea anyways! The effort will be well worth it for your mehndi and sangeet. 11. Earth to sky parted bun: Called so simply because the hair is parted diagonally from the nape to forehead. One part in braided and the other part is made into a bun. The braid is then wrapped around the bun for an edgy twist. 12. Back bow: Tell your man you are a gift to be treasured! 13. Double fold bun: Follow the instruction to make this bun if you have sleek and straight long hair. 14. Waterfall braid: Easy as can be – if you follow the steps carefully. 15. The Ballerina bun: This dramatic hairstyle will be worth the effort you put into practicing it! 16. Braid with twisted side sweep: Separate your front and top hair from your crown and make an exclusively twisted side sweep with it. Braid up rest of the hair. 17. Giant Braided Bun: Celebrate your hair by tying a really high ponytail, braiding it and then wrapping it around to create a gigantic bun. For added drama, edge the braid with a parandi or some colored ribbon or gota. 18. Teased retro side pony: Ideal time-saving hairdo. 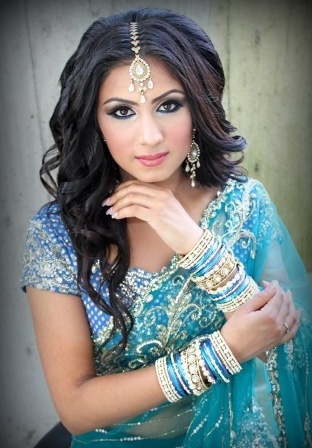 Follow the images and accessorize with a gajra if you like. 19. Messy buns: Messy buns look great with twists and waves. Curl or create waves starting from the centre of your hair, while you leave the upper half straight. Twist the hair on the sides and bring it back. Tie the hair into a bun at the nape of the neck. Secure with pins and accessorize.Leave a few ringlets along the sides. 20. Effortless side braid: You cannot really go wrong with this one. Whether you do a simple side braid or go in for a more complicated fishtail braid or a seven strand braid, the end look is classy and graceful. Just make sure you do not make the braid too tight, as that will give it a stiff look. The braid needs to be loose and relaxed so that it looks voluminous. Finish up with some hairspray to keep the braid from unraveling and to keep any flyway’s under control. 21. Section braids: Braid a two inch section, secure, braid again. Tease gently. Done. 22. Long and loose: Show off your tresses but do give them a texture by tonging them or putting them in jumbo rollers to create unreal mermaid-like waves.